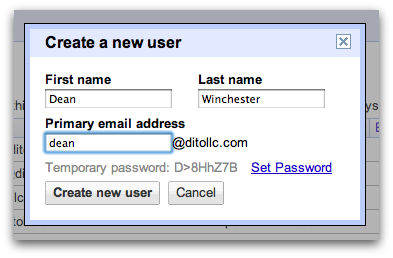 Creating a new user in Google Apps is one of the basic tasks administrators have to complete when managing a domain. If you are new to Google Apps, this blog post may be of some assistance in helping you become familiar with the features/functions in the Admin Control Panel. 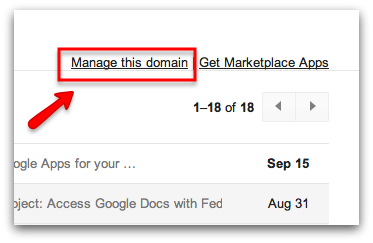 Once you have logged in to your account (Gmail), you will notice a 'Manage this Domain' link toward the upper right hand corner of the inbox. Click on that link to view the Admin Control Panel for your domain. Now that you have arrived at the Admin Control Panel, locate and click on the 'Organization & Users' tab in the upper left hand corner. After clicking on the above mentioned tab, you will see a list of the current users that have accounts within your domain. The next step you will need to take is to click on the 'Create a New User' tab above the user list and enter the new users information (first name, last name, primary email address, and optional password <A temporary password will be provided automatically>). Be sure to click 'Create new user' to ensure the user will be created. Once the steps above have been completed, you will see a pop up window that contains the new users details. The new users information will also be available in the user list under the 'Organization & Users' tab (alphabetical order). To see additional details about this user, simply locate the user in the users list and click on his/her name.